Read this guide on downloading and installing the app to ensure you use the correct version for your device. Once you've installed the app, login using your existing InventoryBase account email address and password. Upon logging in for the first time, you'll see a brief tutorial showing you through the various screens of the app. Press 'Dismiss' to swipe through the tutorial screens, and swipe down when finished. You'll now be presented with your empty inspections list. Swipe down or tap 'Fetch' on the upper right to download a report that has already been created/assigned to you online. Your assigned inspections will appear and you can highlight which ones you want to download. If you need to create the inspection and haven't done this already online, you can tap the blue Plus button on the bottom right to create one now. You'll need an Internet connection to download or create inspections, but once the reports are downloaded you can continue offline until you want to upload them, where we recommend a strong WIFI connection, especially if you're syncing lots of photos and/or videos. From your inspections list, tap on the address of the property you wish to start the report for. The Inspection Info screen contains all the preliminary information for the report, including a link to find the address on Maps, the type of report, reference, location of keys and any notes added to the inspection or property. If contacts have been added in advance online then they will show under the primary inspection details, with clickable email addresses and phone numbers. When you've arrived at the property and are ready to begin the report, tap Start Report. Confirm that the report status will update to Active. Tap on the Camera button to take a photo of the front of the property or the entrance to the property which will be saved for next time you visit and show as the cover photo on your final report. When you're ready to begin editing the report, tap on the 'Edit Report' button. The first page you'll see is a list of rooms. If your list is empty, tap on the blue Plus button at the bottom of a page to add a template, or a single room. 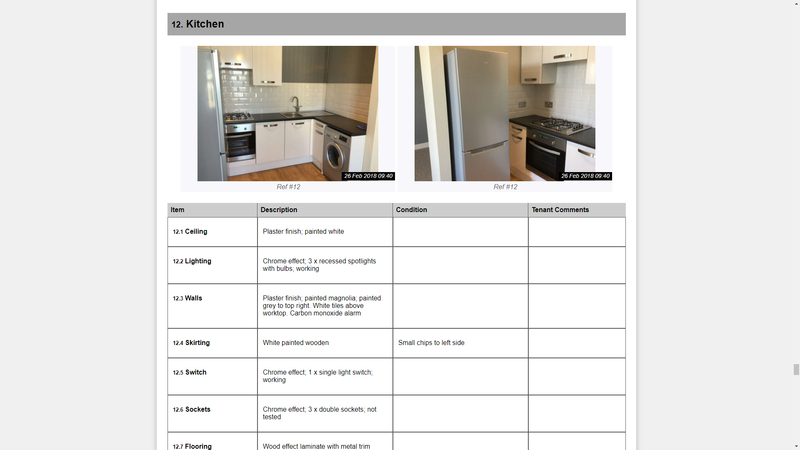 Templates provide a preset list of common rooms and items ready to copy, complete or remove. You can append one or multiple templates to your report, just tap Apply next to each template and click Done on the top right when finished. Detailed - Item, Description and Condition fields. Overview - Item and Condition/Comment fields only. To rename the room/area, tap on the 3 dots then Rename Room to popup the edit screen. To copy or duplicate a room/area, tap on the blue copy icon to popup the Copy window. The copy window will allow you to select which rooms to copy the selected items (all items by default, click the top row to select specific items). You can create new rooms from this window by tapping the 'Add Room' line at the bottom of the room list. If you're copying items to existing rooms, you may want to select 'Overwrite existing' at the top of the screen so that the app will append the descriptions and conditions to any matching items in the destination rooms. To remove a room from the report, just tap on the red trash icon. To modify the contents of a room/area, tap on the room/area name within the list and you'll be presented with the Items screen. Tap on each field to complete your observation. Description and condition fields will load your personal dictionary and suggest as you type. You can scroll through and pick from the list or type short phrases to search your dictionary quickly (i.e type 'wpwd' for 'White painted wooden door' or 'fwt' for 'Fair wear and tear'). Read more about the Dictionary and Auto-suggest features here. To input observations using speech-to-text, tap the Microphone icon on your keyboard and speak while focused on the correct field. Read more about Speech-to-text here. To take room/area overview photographs, tap the 'Add Primary Photo' or 'Select from Gallery' buttons at the bottom of the list of items. To take photos of specific items, tap on the camera icon to the right of each line item in the list. By default, the InventoryBase Software Camera will be used. This camera allows you take multiple photos in a row without having to close the camera each time. The Software camera, however lacks the HDR functionality of the Device's stock camera. You can switch to the Device camera in your app's Settings page if you wish to take HDR photos, especially in low light conditions. Any overview photos will show at the bottom of the rooms list, and if you have any item-specific photos then the Camera icon will show green for each line item that has photos. Tap on the green camera icon to view item-specific photos or add more. To attach 360 photos, capture the photo using your designated 360 Photo App and Device (i.e. Samsung Gear 360) and use the Select from Gallery button. You can also attach HD or 360 videos using the same method above. To record a new video, tap on the blue Plus button on the bottom of the page and select Record Video. The built in video recorder will allow you to record both video and sound together (providing InventoryBase has permission to access the Microphone). You can choose which format Videos record in from your app's Settings page. Choices include High Definition (720p/1080p) or Standard Definition (480p) formats. To flag an Action or Issue for a specific line item, tap on the Triangle icon to the right next to the camera icon. Select the appropriate action from the popup, i.e. "Needs Maintenance" and the corresponding party responsible for this action/issue, i.e. "Tenant". Any additional comments for this issue can be added which will show on the report for this action item, highlighted in orange. If the comment is left blank, it will repeat the contents of the item's Condition field. You can also type custom actions or customise your default actions list on your web dashboard settings page. To copy, duplicate or remove an item, swipe the item name to the left to reveal the side menu on the right. You can choose to copy this item including its description and condition, and other items too, immediately to other rooms or duplicate it within the same room. Tap on the Record button on the bottom toolbar to begin recording. The bar will turn red when recording and you can pause recording by tapping again in the middle of the recording bar. Pausing recordings saves them automatically as a clip. You can play back all clips in order by scrolling to the very bottom of the Items list and tapping play on the player window. If you wish to play or delete any individual clips, tap on the List icon on the right side of the audio player and the list will expand. Delete clips by swiping individual lines to the left. These audio clips will be available to play back in a similar player once the report has been Synced (uploaded) via the online Report Editor. Read more about working from audio dictations here. 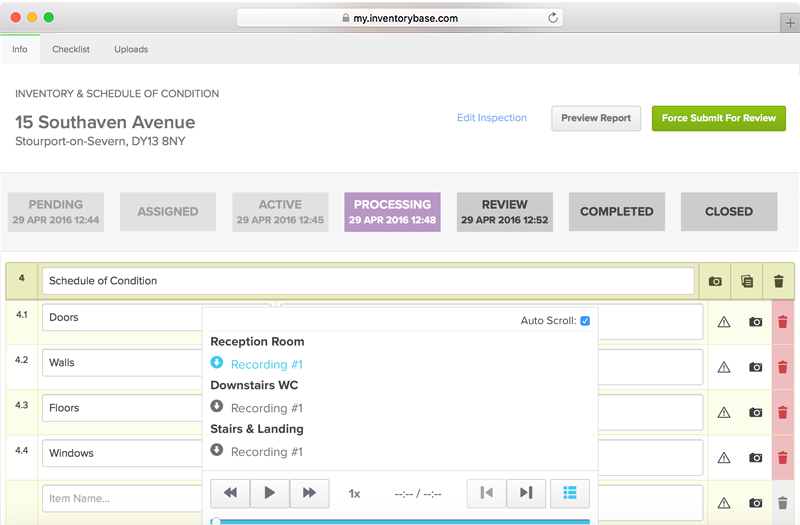 You may also configure InventoryBase to automatically send audio transcription jobs to InventoryBase's pool of typists or your own designated typist team users. Read more about the built-in transcription features here. Once you've completed your report, tap 'Preview' on the top right of the rooms list to navigate to the report preview page. On this page you'll see an option to Complete the report on the top right. Tap this to mark the report completed. You can still tap re-open on the top right to make further amendments to the report if required. If you need to capture signatures, you can do so now the report has been completed. A blue pencil icon will appear on the bottom right of the report preview page. Tap on this to collect a signature now. Note: If the signees aren't present, signatures can be collected online later. If you've already entered contact and signee details online, you'll be prompted to choose who's signing the report, otherwise select the signees status (Tenant, Landlord, etc) in the dropdown and enter their details before collecting their signature. Once all signatures have been collected, you can choose to upload your report now or later when you're back online. Navigate back to the Inspection Details page, and click on the Sync Report button towards the bottom of the page. InventoryBase will automatically detect your Internet connection and advise if there's a problem, otherwise once confirmed you'll see the Sync Progress screen appear which should start uploading your report data. We limit the number of simultaneous uploads to not overload your device or connection, so if you've got hundreds of photos, especially videos, you'll need to wait a while for it all to upload. Your screen will not go to sleep during this time so you can keep an eye on the progress. If the upload stalls or sits idle for a long period of time, you can tap 'Retry' to try again or resume the upload. Depending on your connection it may take more than one Sync attempt to upload the complete report. Once the upload is successful, the status bar will turn green and tapping Done will safely remove the report from your device. If you left the report as Active or configured the system to send reports to a Review stage, then your report will be editable online and not yet delivered to any third parties. If the report has been moved to the Complete stage, it will automatically send to any selected clients and recipients and will be available to view immediately online via a secure URL. Users can choose to read the report online or download it as PDF. See Viewing & Sharing Reports for more information.